Mali bluestone with the honed finish endears itself to indoor applications. It creates a formal, classic look wherever it is laid just as the same colours are stunning in suits and fashion accessories for women and men. This stone is dark in colour so any staining will not be as noticeable as they might be on lighter coloured stone. The honed bluestone doesn't offer as much slip resistance as the flamed bluestone, yet despite this, it's a favourite choice for many, due to its magnificent natural beauty. The Mali treads are very popular for use on outdoor stairs, fireplace surrounds and verandah edges despite the poor slip resistance characteristics. The honed treads are magnificent and their sheer beauty often over-rides practicality! Explanatory Note - Mali bluestone has a a finely honed surface that offers elegance but nil slip resistance when wet. The dark surface will absorb heat if used in exposed settings. Mali Bluestone is ideal for use on indoor floors such as kitchens, sun rooms, living rooms and bathrooms. This is because it's easy to clean and highly durable. It doesn't show dirt, it doesn't wear out easily and finally, it has low water absorption rates that give it natural resilience against staining. It is also well suited to indoor and outdoor stairs (thanks again to it's highly durable nature), feature walls and verandahs. Treads are also popular for outdoor stairs, fireplace surrounds and verandah edges. The designers of the newly opened Alpha Restaurant at Sydney's Pan Hellenic Club incorporated honed Mali bluestone throughout. 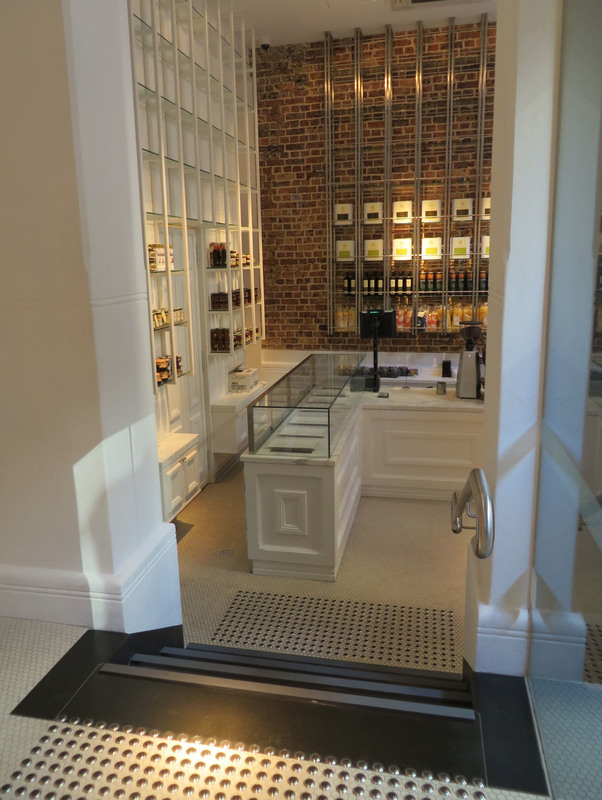 This image shows Mali teamed with timber flooring at the grand entrance to the restaurant. 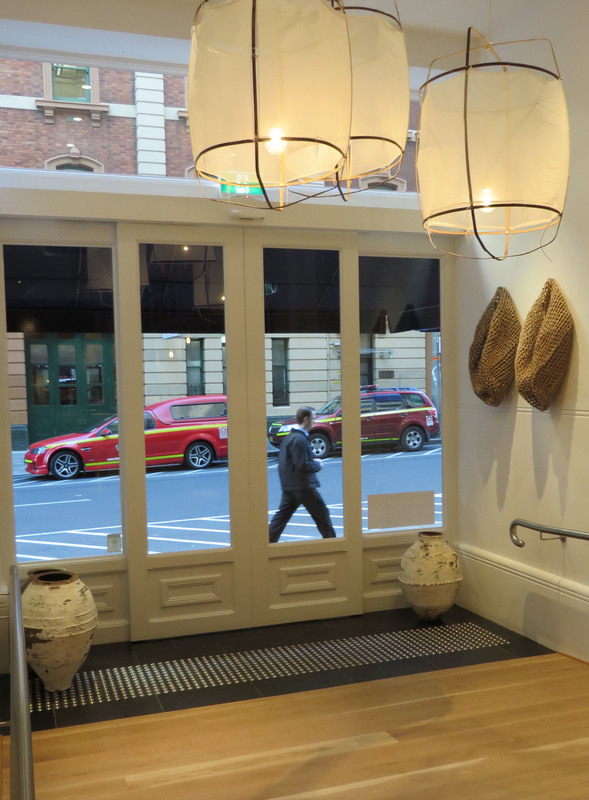 The designers of the newly opened Alpha Restaurant at Sydney's Pan Hellenic Club incorporated honed Mali bluestone throughout. This image shows where the stone was used on the stairs leading from the restaurant to the coffee shop below. The designers of the newly opened Alpha Restaurant at Sydney's Pan Hellenic Club incorporated honed Mali bluestone throughout. This image shows honed treads with a rounded bullnose edge used on their outdoor window sill. This stone is very, very dense with small pore spaces that may make 15mm thick tiles susceptible to slight curling at the long ends of rectangular (e.g. 600x400mm) shaped tiles if slow setting adhesives are used. This is less likely to occur in tiles that are square in shape. As a precaution, the use of a rapid set adhesive is recommended. This curling is highly unlikely to occur in 30mm pavers and treads as they have far greater flexural strength by virtue of their thickness.